Skier’s Thumb is an injury that occurs when the ulnar collateral ligament of the metacarpal phalangeal joint of the thumb is injured. The ligament can be injured when the thumb is bent back away from the fingers (hyperextended). A sports injury, such as during a fall from skiing, can cause Skier’s thumb. It is treated with immobilization or surgery. Cases that receive prompt treatment tend to have the best outcomes. This injury was formerly known as Gamekeeper’s Thumb, due to stretching and tearing of the ligament from breaking the neck of small animals during hunting. The head of the first metacarpal bone and the base of the proximal phalanx in your thumb meet to form the metacarpophalangeal (MCP) joint. 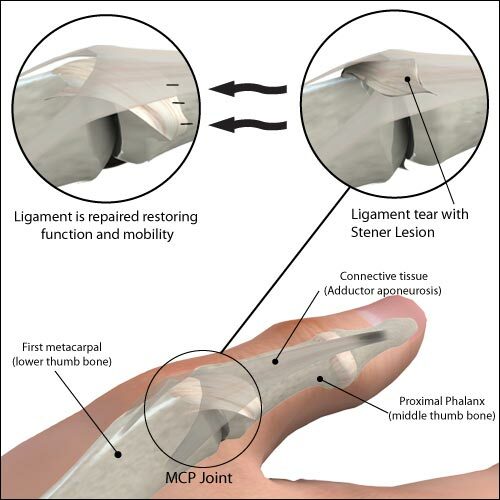 Strong ligaments on each side of the MCP joint stabilize it from side to side. The ulnar collateral ligament attaches to the web space side of the MCP joint. The ulnar collateral ligament is used whenever you hold an object. Skier’s Thumb, also called Gamekeeper’s Thumb, occurs when the ulnar collateral ligament is injured. 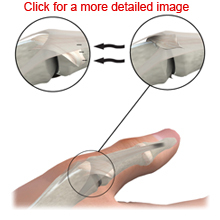 The injury occurs when the thumb bends back away from the fingers (hyperextended). This motion can happen to anyone, but it commonly occurs in sports. It can happen if a skier falls while holding onto a pole or during football if a player’s hand is caught on a jersey or facemask during a tackle. The ulnar collateral ligament can partially tear or completely tear (rupture). If the ligament ruptures and tissue comes between the ligament ends (adductor aponeurosis), it is called a Stenner lesion. This prevents the ligament from healing without surgery. The ulnar collateral ligament can remain in one piece but pull a piece of bone away from where it attaches at the base of the thumb. This is called an avulsion fracture. Skier’s Thumb causes pain and swelling. Your skin may bruise and appear discolored. Your MCP joint may feel weak when you pinch, grasp, squeeze, or hold objects. A ruptured ligament may form a Stenner lesion near the base of the thumb on the palm side of your hand. This appears as a bump or thickening in the region of the ligament. Your doctor can diagnose Skier’s Thumb by examining your thumb and performing X-rays that can reveal an avulsion fracture. Stress X-rays can aide the diagnosis by indicating joint instability. You may receive a local anesthetic prior to the test because it can cause pain. If your ligament is partially torn, your thumb may be immobilized with a thumb spica splint or cast to help it heal. Following casting, you may need to wear a thumb spica splint during activities. Hand therapy rehabilitation can help you strengthen your grip and regain motion. Surgery is recommended for complete ligament tears and avulsion fractures. Ligament tears are repaired with sutures in an outpatient surgery. The ligament generally tears from the proximal phalanx, so repair involves reattaching the ligament to the bone. There are several methods to do this. Avulsion fractures are repaired with surgical hardware to hold the bone fragment in place. Surgery is followed by hand therapy rehabilitation. Delayed treatment for a complete ligament tear usually requires reconstruction of the ligament with some type of graft as the condition of the ligament is too poor to allow direct repair. Skier’s Thumb injuries that receive prompt treatment have the best outcomes. A person that receives surgical treatment for Skier’s Thumb can typically resume normal activities in about three months. Skier’s Thumb injuries that are not treated are at risk for developing arthritis and chronic instability. You may be able to prevent further injury and impairment by receiving prompt medical treatment for Skier’s Thumb injuries. 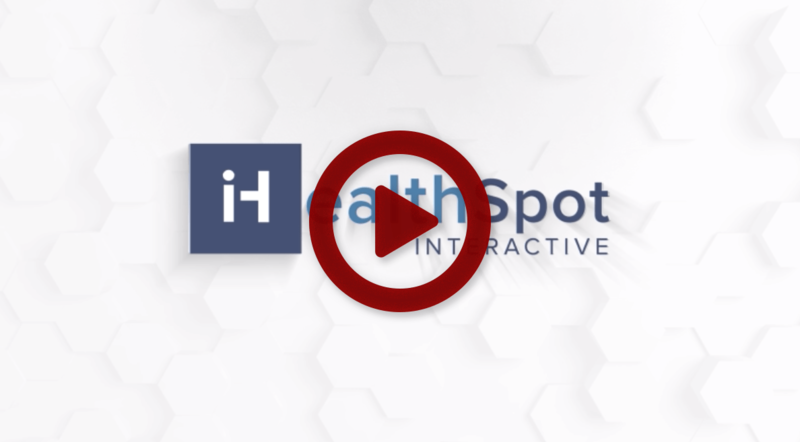 Injuries that receive early treatment tend to have the best outcomes. You should adhere to your splint-wearing schedule and perform your home exercise therapy program.